Does Calving Season Equal Culling Season? This photo was taken within minutes of the calf being born, and within seconds of it standing for the very first time. Calving season is one of the most exciting, frustrating and tiring seasons of the year for many cattlemen, explained Heather Gessner, SDSU Extension Livestock Business Management Field Specialist. "This is a time when the only thing that compares to watching a newborn calf struggle to its feet is the sound of it nursing its dam for the first time," Gessner said. However, when best laid plans do not work out as expected, and a dry cow results, Gessner said cattle producers need to have a management plan in place to maintain an efficient and economically viable cow herd. "Management of cows that lose their calf at or during the calving season, must be considered in order to save high quality feedstuffs for lactating cows," Gessner said. "The cows that lost a calf should be managed to minimize unnecessary weight gain (if the cow is already in a body condition 5 or higher) and reduce competition for feed within the herd." Gessner added that selling dry cows may provide a revenue source during a time of the year when feeder cattle or open cows are not traditionally sold and allow for utilizing feed resources for the productive animals. Cull cow prices were not immune to the drop in cattle prices at the end of 2015. Fourth quarter 2014 prices were nearly $100 per hundredweight higher than the same quarter 2015, $173.59 compared to $77.80. The Economic Research Service (ERS) is forecasting average prices of $84-92 per hundredweight and $84-96 per hundredweight for the second and third quarters of 2016, and $87-99 per hundredweight for the fourth quarter 2016. While the price range for March through September are similar, feed costs for those months must be considered when determining when to sell the dry cow, if she will be sold prior to preg-check culling time. Body condition score – Dry cows in "good condition" generally bring a higher price per pound than thin cows. Good condition would be a body condition score of 5 or higher. Thinner cows may benefit from time on feed to gain additional weight prior to culling. Develop a feed budget to compare feed expenses with anticipated returns when the dry cow is placed on feed. Medication withdrawal times – Beef Quality Assurance (BQA) practices and good husbandry require that all withdrawal times are adhered to. This is an important responsibility cattlemen must embrace. Read and follow the label instructions on all medications: injectable, pour-on or fed. Genetics – Depending on the age of the dry cow, genetics may be an important factor. Younger heifers and cows should provide genetic improvements to your herd through sire selection and normal herd culling. If the dry cow is old, culling her to invest in a genetically superior female should add productivity to your calf crop without extra feed requirements. Space and time – During calving season, time is often limited. Management of the dry cow will add space requirements as well as additional time required to feed these animals. If additional space and time are not available, it may be more effective to focus on the cow herd that will be providing an income in 2016. Dry cows held over will not provide a "calf check" until late 2017 given a traditional spring calving season. It is critical to budget how much it will cost to run a dry cow for this time period and then determine how many additional calves it will take for her to pay for not raising a calf during one year. Evaluate the reason for the calf loss. If she is a young cow that wouldn't claim her calf or ended up killing the calf, she may need to be culled when she is in the best body condition because this may be something that she will continue to do as she calves in the future. 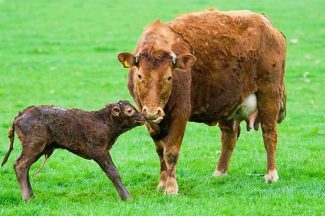 However, if the death loss was due to environmental factors, such as a storm or mud and the female has the most valuable genetics for your herd, it may be of value to graft a calf from an older, less desirable cow onto her. This will give her the opportunity to raise a calf and stay in the herd, while culling the older cow. "Given the current cattle price situation, carrying a cow until 2017 without producing a weaned calf may not be an effective use of feed or labor resources," Gessner said. Beef cattle budget worksheets can be found at http://www.sdstate.edu/econ/extension. "These budgets are in an Excel format and allow individual operations to input their own feed costs and other expenses to determine enterprise costs for different classes of beef cattle, including the Beef Cow and Replacement Heifer," she said. To learn more, or for additional insight and assistance using the budget calculator, contact Gessner or Shannon Sand, SDSU Extension Livestock Business Management Field Specialist. To discuss nutritional requirements for the dry cow contact any one of SDSU Extension Cow-Calf Field Specialists, Robin Salverson, Adele Harty, Warren Rusche or Taylor Grussing.